The Bontrager Old Man Winter boot. What a boot. While it took a while for winter to show up in Iowa I knew it was right around the corner, and I would be prepared! 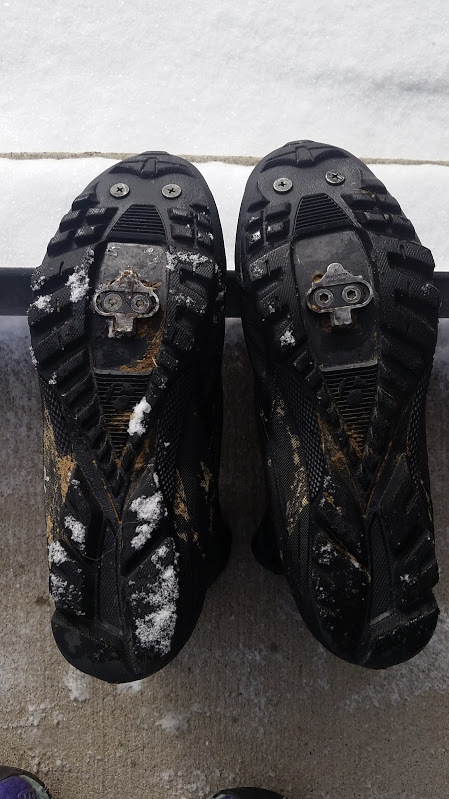 One of the most important things about winter boots for me is how easy they are to get off and on. Getting the boots off and back into my warm house at the end of the day is key. Right out of the box, the boots are considerably lighter than my other cycling specific winter boots. A quick plop on the scale showed that they are at least 200g lighter per boot on average. The first thing I did was pull the inner liner out and pop that on my foot. Super simple. I laced the speed laces before putting my foot in the boot so I could tighten it all the way from the bottom, making for a snug fit. Getting the boot on over the liner was very easy. The zipper didn’t need any force to close, two Velcro straps later, and I was ready to go! After clomping around indoors to get a feel for the fit, I was happy to see that there was enough room for me to wiggle my toes. The arch and heel of my foot stayed put. The outer boot did not hit rub my ankle or calf anywhere and stayed put. My first few rides were actually my daily commute to the shop. I added in a little bit of townie single-track to spice things up. The OMW performed like a mid-range mountain bike shoe. The fit made the boot feel less bulky. My ankle was free to move, but the boot didn’t move around my foot at all. The sharkskin anti-slip fabric on the heel probably aids this. The two other winter boots I usually use fit more like a typical winter boot, they are not my favorite thing to wear when riding single-track because they fatigue my feet. Getting the boots out on some longer, colder rides was when I really started to put these through their paces. I added the Ember taillight to the back of the boot. This added Velcro strap could handle any small taillight. This was one of my favorite features because with the shorter days I sometimes forget to bring a taillight with me. I was able to leave two taillights on my boots! Captain Safety would be so proud. For these longer rides the temperatures would typically start somewhere around 10 degrees and hopefully get up to 30 or higher. I was very comfortable throughout this wide range. I stuck to wearing a wool sock in the mid-range weight, I never felt the need for a heavy wool sock. I did try to use a foot warmer packet, but it limited the movement of my toes. The tighter fit was nice, but no toe warmers for me. The breathability of the boots really shined when the temperatures would sneak up around freezing. I never felt the dreaded swamp foot with the warmer temperatures. Some of the other small features I really liked were the drawstring closure around the ankle. This kept slush and snow out of the boot, but allowed me to sort of regulate air flow. I could open it up if I needed a little cooling down. This drawstring closure, just like nearly all other winter boots, don’t block out water completely. A word about the waterproofness, they are very much so. I stomped around in some giant puddles thanks to the winter rain storms and I am happy to report I stayed dry. The boot also moved with me while walking adding traction and confidence when I inevitably needed to get off my bike to walk. The tachyon rubber outsole was very grippy off the bike. The sole of the boot is made from a composite material, but isn’t as stiff as a standard mountain biking shoe. Finally, what you are all wondering. Did I ever take the boots off? Why yes I did, and very easily I might add! I just undid the Velcro and zipper and took the outer boot off. The liner stayed in place, leaving me with a little house shoe to slip around in. After taking off the liner, I was able to dry the liner separate of the outer boot. That was a game changer. I could also throw the liner into the washer for a normal spin, and if needed for a quick warm up 15 minutes in the dryer didn’t seem to harm the liners. I even held the liner near an industrial strength space heater during Tuscobia to get rid of moisture in the liner. Overall the boots were very durable. The only way I damaged them was my falling down some stairs, not on my bike, and breaking an ember taillight. Go me. I was easily comfortable from 32 degrees to around 10. Anything below 10 degrees and I wanted a liner sock to help keep heat in. I also paired the OMW’s with a gaiter when the temperatures dipped below 0. I rode with these boots down to -20. At that point, not much is going to help beyond getting crafty. Typically, I would ride with a boot a couple of sizes too big so I can add socks. I would not want to size up with the OMW because of the tighter, more performance oriented fit. I just cannot see myself fitting extra socks with the removable liner and making it work, but that is why the boot does not have a temperature rating. It is different for every person. The lowest temperature I would say I stayed comfortable was -5. I am very impressed with that number. In closing, these are great boots. They are suited for a myriad of riding styles from commuting to single-track to long days in the saddle. I could easily dry my boots after my commute and have them ready later that day. The Tundra last made the boot more comfortable on single-track and longer rides. I cannot stress just how nice the removable liner is. While you cannot purchase the liner separately yet, the durability and quick drying leads me to believe I would not need one anyways. Also with a price of $299, I could not really see much room for change or improvement. This is a versatile boot, for a varying season! $299 usd! That works out to $450 cnd. No thanks. I will stick to my Sorels.